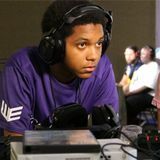 Wrath is an SSB4 Sonic player with a strong Bayonetta secondary from Atlanta, Georgia, and is considered one of the best Sonic players in the world along with KEN. Wrath is currently ranked 59th on the Panda Global Rankings 100 and was formerly ranked 1st on the Georgia Smash 4 Power Rankings. He has taken sets off of players such as Ally, ESAM, Fatality, Mr. R, MVD, Vinnie, Zenyou, Rich Brown, dyr, ScAtt, and Salem. On January 13th, 2017, Wrath was signed by FlySociety, but soon left the team. Wrath's play is characterized by his patient, defensive style, and he is considered a pioneer of the "defensive Sonic" style. He displays an adept ability to anticipate his opponent's options whilst forming counters to their actions. This playstyle is effective, but often criticized from an entertainment standpoint, particularly by commentators. Wrath is the only Sonic to have a set win over Salem's Bayonetta in SSB4. This page was last edited on March 10, 2019, at 21:44.